Turn the page of the calendar and you may be surprised. It's November already! Thanksgiving is on the horizon and we're about to go full-throttle into another holiday season. Plan your month around these fun things for families to do together in November. Kids may still be counting their Halloween loot but November is the time to look forward to Thanksgiving. Raise thankful kids with a month-long lesson on Thanksgiving, its origin and true meaning. Show them you're thankful for them with things to do as a family every day. You can also begin to work on Thanksgiving feast preparations. Make an easy meal plan with your kids. After the menu is set, enjoy Thanksgiving-related crafts together. A turkey handprint captures those tiny hands and turns them into a turkey keepsake. Make your own Thanksgiving tablecloth with your kids to use on turkey day. Or try a number of other Thanksgiving crafts to keep you busy all month long. The temperatures are getting cooler and your kids are starting to wear more sweaters than T-shirts. 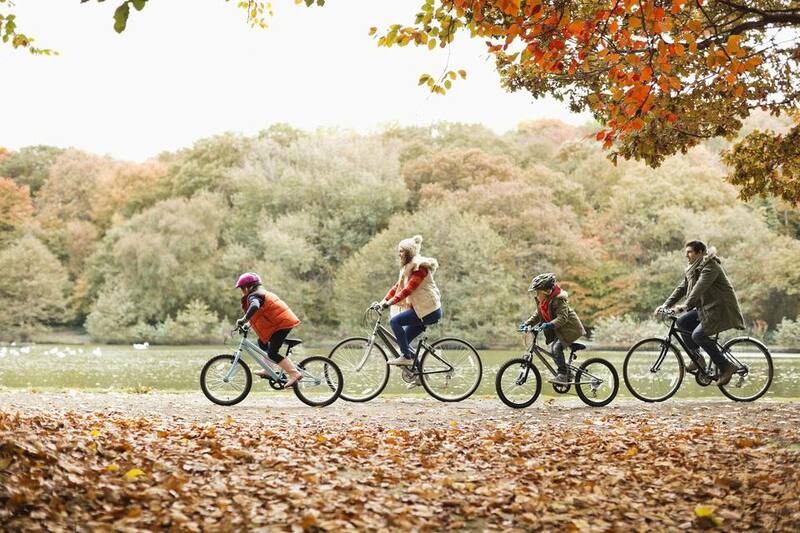 The fall season will soon come to a close, so make the most of it with fun fall activities. Hurry because Old Man Winter is waiting around the corner and he'll surely chase us indoors until spring. You want your children to be safe and protected 365 days a year. There's no time better than right now to teach them the fundamentals of staying safe. Raise street smart kids who are prepared for dangerous situations and are well aware of their surroundings. Go over fire safety tips with your family. Make sure your home is properly childproofed. If the word "safety" comes to mind, you can make a lesson out of it. Most little kids love airplanes. November has a special treat in store for them. It's Aviation History Month. Take flight with activities that prepare your kids for riding in an airplane. Even if you're not planning on jetting off somewhere, the kids will love pretending in the airplane you've made in your living room. When it's time to come down from your big adventure, read one of many children's books about the Wright Brothers. Then settle in to create air transportation crafts. Your future pilots and air travelers will never want the month to end. Choo choo! Boys and girls are fascinated with trains. This month celebrates model trains and it gives you and your children a fun way to play together. Play with the most famous train of them all, Thomas the Tank, or build your own custom model railroad with tracks, trains, a city, people and buildings. There are so many model railroad activities for kids to enjoy that you may find yourself playing with trains long after the kids go to bed. It's going to get loud in your house this month. International Drum Month is a long-running awareness campaign from the drum and percussion industry. Pull the pots and wooden spoons out in your kitchen and let the kids liven up your home with a new beat. Make a homemade drum or bongo out of an oatmeal can. There's no limit on the number of music activities to enjoy with your kids. Your goal is simple this month: share music with your children. If your kids love peanut butter, November may become their favorite month of the year. Get in the kitchen and make all things peanut butter. From peanut butter apple slices to a peanut butter banana smoothie. Take this time to also talk to your kids about kids with peanut allergies. It is important kids understand how a life-threatening peanut allergy affects their friends. Passing a peanut butter sandwich or a piece of candy that contains nuts to a friend with a peanut allergy could cause an allergic reaction. Although you don't want to scare your children, there have been too many reports of children who were unaware of the severity of peanut allergies giving a friend something with peanuts in it and then that child has a reaction. Some have even died. Kids can become more aware of the foods they're eating while understanding they can be dangerous if not handled properly. Millions of Americans have epilepsy and your children may have a friend who is one of the 300,000 under the age of 14 who has it. Teach your kids about seizures and how epilepsy affects their friend. Just as important is to tell them how to get help if their friend starts exhibiting signs of a seizure. When you can barely sit through a meal because you're so busy trying to hide food in your picky eater's favorites, it's hard to think about good nutrition for your child. And for those picky eaters, this month is a good time to put picky eater strategies, like the one-bite rule, into effect. Mealtime will be fun again soon. National Adoption Month presents an opportunity to talk to your kids about families and how they're formed. While your family may be a mom, dad, and three biological children, another family may be made up of children who are adopted or a mix of both biological and adopted children. As your children grow, extend the lesson to discuss diversity in families. Children can learn so much about family dynamics and that makes them grow into well-rounded, tolerant, empathetic adults.